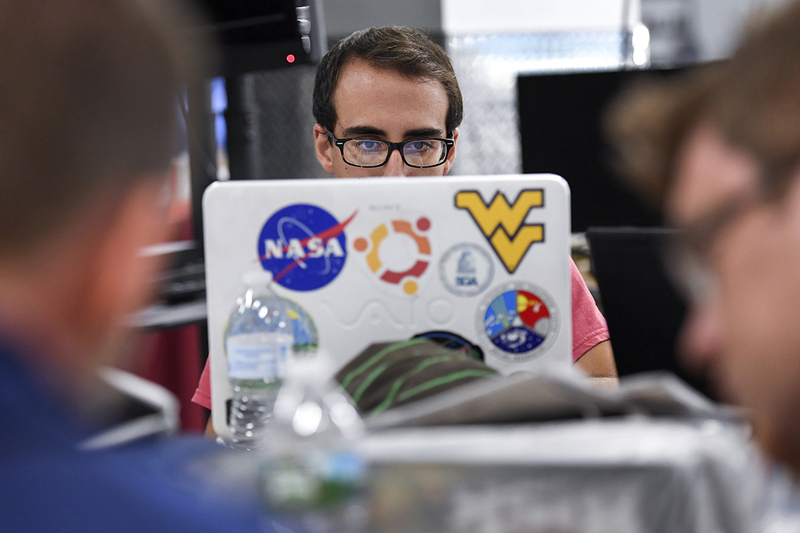 WVU Robotics team member Nathan Tehrani reads the screen on his laptop, which is covered with stickers including the Flying WV and NASA. Tehrani and his teammates were sequestered Sunday, Sept. 4, 2016, one day before competing in the NASA Sample Return Challenge in Worcester, Massachusetts. MORGANTOWN, W.Va. — For the second straight year, West Virginia University’s online graduate program in software engineering has been ranked in the top 15 nationwide by U.S. News & World Report in its Best Online Program rankings. According to Program Coordinator Dale Dzielski, the software engineering program focuses on continuous improvement by offering the latest in advanced coursework including data analytics, Internet of things and cloud computing, cybersecurity, mobile app and agile development. The program, offered by the Statler College of Engineering and Mineral Resources, joins a number of other WVU programs – online hybrid MBA (47 out of 267), nursing (51 out 154) and business (non-MBA) (63 out of 158) – that were featured in the rankings released Tuesday. More than 1,300 online programs were reviewed on categories ranging from student engagement, faculty credentials and training and peer reputation.